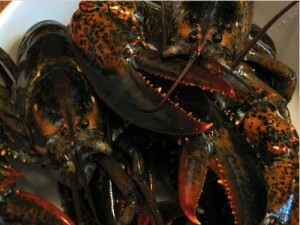 Canada is known for its seafood, including lobsters, coldwater shrimp, salmon, halibut, and other products. Canada’s unique geographic location allows fishermen to access some of the world’s most productive fisheries. In the east, the Maritime Provinces of Nova Scotia, New Brunswick, and Prince Edward Island (PEI) are known for their lobster production. Other important fisheries include herring, sea scallops, and groundfish. On the West Coast, British Columbia fishermen harvest salmon, halibut, crabs, shrimp, and other seafood. The northern provinces and territories produce a number of unique products, such as arctic char. Canada’s inland regions produce wild-caught fish as well as products from aquaculture operations. Canada’s aquaculture industry produces Atlantic and Chinook salmon, rainbow trout, arctic char, mussels, oysters, clams, and other species. Approximately 85% of all fish and seafood landed by Canadian harvesters is exported; valuable exported species include lobster, snow and queen crab, shrimp, and Atlantic salmon.